Content duplication usually requires much time and effort. This routine process distracts you from more essential tasks, but it is inevitable especially when you are making a new website within Magento. 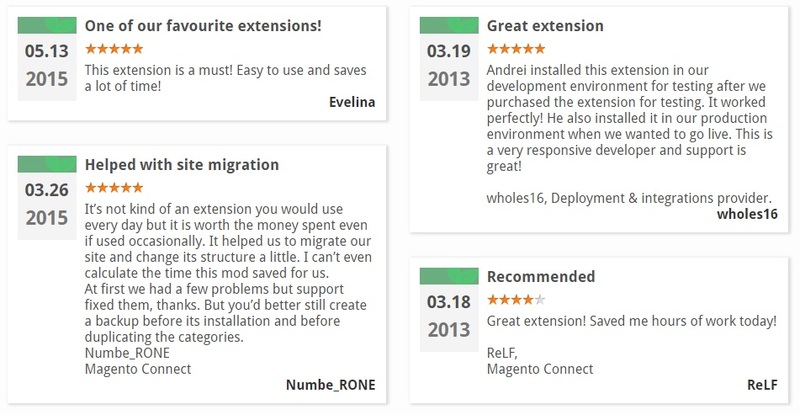 Luckily, there is one useful tool in the portfolio of Amasty – the Duplicate Categories Magento 2 extension. Having installed this module, you can duplicate your categories rapidly and accurately. So, if you have to deal with a multi-store Magento setup, this extension is a must. Support for all store views: ‘Magento copy category from one store to another’ feature. With the Amasty module, Magento 2 category cloning becomes as easy as possible. You don’t have to spend hours of time on this routine task. Just install the module, click several buttons, and the desired content is ready. 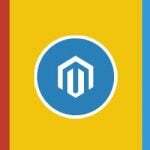 Below, we describe the extension’s features in more details and provide a Magento 2 backend tutorial related to the functionality of the Amasty Duplicate Categories Magento 2 extension. As mentioned above, you will essentially simplify your daily Magento routine with Amasty Duplicate Categories for Magento 2 and 1 by automating time-consuming routine operations. The extension is the number one tool for copying a lot of categories and subcategories. Furthermore, the Magento copy category with products functionality is fully supported. It means that you can freely get products from one store in another. You only have to spend a few minutes on module installation, and routine tasks of duplication will never bother you again. The Magento copy category from one store to another functionality of the module is brilliant. The Amasty’s Magento clone category module provides the ability to perform the most precise duplication. First of all, you can choose a parent category for the category you duplicate. 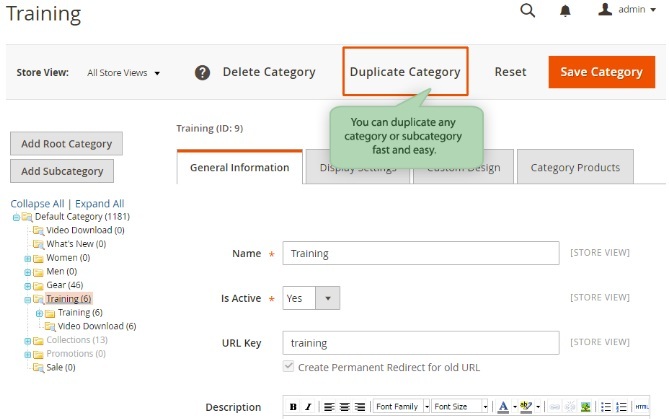 Then, it is possible to duplicate all subcategories and keep all product assignments, if you use this extension. The feature is optional, but it is extremely helpful. By copying all subcategories, you keep appropriate product assignments in the same way. Furthermore, it is even possible to modify category names and descriptions automatically. 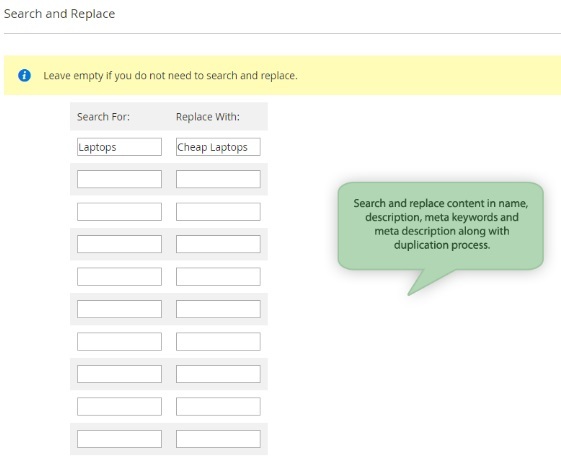 You can find and replace such content as name, description, meta keywords, and descriptions for duplicated categories. 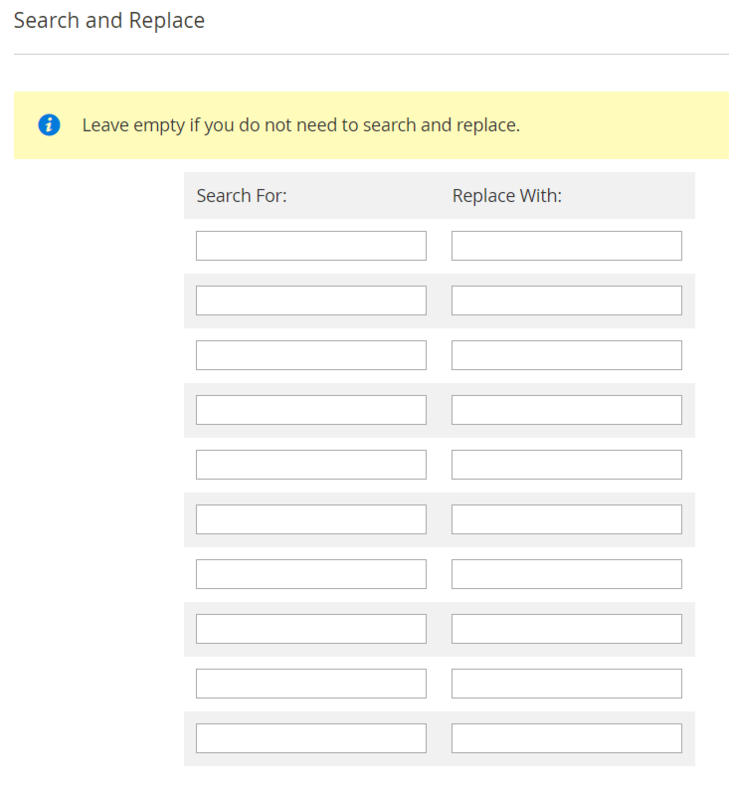 Just use the ‘Search For’ field to find the content you want to replace and place the replacement to the ‘Replace With’ field. You can enhance the potential of Amasty Duplicate Categories for Magento 2 and 1 even more with the Mass Product Actions extension. Both tools perfectly work together helping you perform more actions at a time. 1. Select a category you want to duplicate in the category tree on the left. In our case, it is “Training”. The category contains one subcategory – Video Download. Now, click the Duplicate Category button from the top sticky menu. 2.1. Select a parent category for the copied one. 2.2. Decide whether you want to copy product relations or not. 2.4. Enable/disable copying categories rules (available with the Magento 2 Enterprise Edition). 2.5. Next, you can customize the existing category names and descriptions. Specify a word or a phrase you want to replace and type the text that should be used instead. 3. 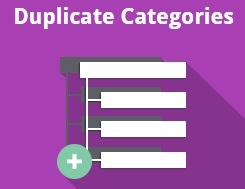 Now, you can find the duplicated category in a category tree. Further customizations can be applied as usual.